At the beginning of last month, I was sewing a friend a purse for her 30th birthday and with literally one inch left to sew, my machine broke. Nothing was caught anywhere but the gears would not turn. I sewed the last strap end to the D ring by hand, but what about my machine? I tried oiling and cleaning it, searched all over for anything caught in it or in the way, and came up with nothing. I took it to the SewVac in town where they told me that they’d do a free estimate but due to the age of my machine (32 years old), finding a major part could be difficult if not impossible. Now I got this machine, a Singer Touch Tronic 2001 Memory Machine, about seven years ago. I was driving down the street with my mom and it was just sitting at the end of someone’s driveway on a sewing table, with a chair, looking like it was ready for someone to sit down and sew on it. I made my mom turn around and we went back and stopped. There was no sign asking for money but I went up to the door and checked that it was just free for the taking. The woman told me that it used to be her daughter’s but she no longer wanted it so I was more than welcome to it. Luckily we were in my mom’s SUV so we could load up everything including the furniture. The only thing missing was the power cord / foot pedal, which I was able to find at the Pitman SewVac. 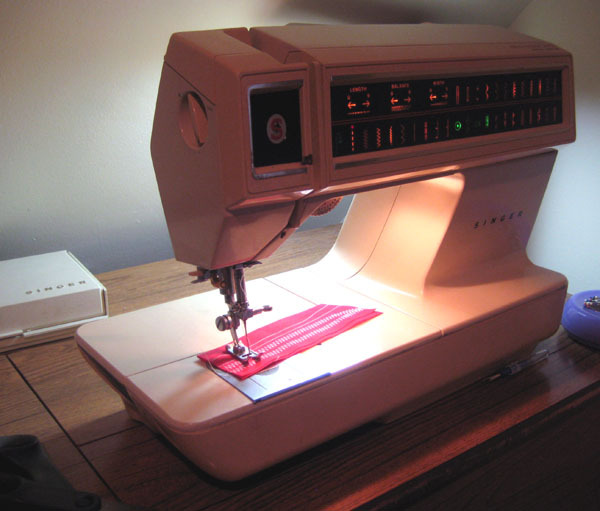 There I found out that my machine was from 1978 and it was the first computer-controlled sewing machine. I found a copy of the manual online and I was set to go. I’ve never once had a problem with the machine, although I had to get the pedal repaired once because it kept sticking, and I’ve made many things with it. I love my old sewing machine and have no desire for a new one. The older ones are much better made than they are now. Also, I’ve just recently found all the original accessories for it online, including a bunch of special feet. I called back to get my estimate and was told Singer had the part and it would be ready in two weeks. Hooray! But after two weeks, I called again and was told the part was on backorder. Fine. Then they called me a few days later to say it was out of stock and no longer made. Apparently Singer can’t just tell them that the first time they call. They offered to give me money for it as a trade-in but a comparable quality mechanical machine would be around $300 and a comparable quality computerized machine would be around $800. I told them I’d think about it. And I did, for maybe five minutes. Like I said, I love my old machine and newer ones just aren’t as fun, even if they do have the same functions and more. I started looking on ebay for the same machine so that I could harvest it for parts. One in excellent working condition had just sold for only $40 but I missed out on that. A few more came online but they were either not in that great of condition, cost too much, or were pick up only in Florida. I decided I would just keep waiting and looking and went to the shop to pick up my machine in the meantime. I explained what I was doing and asked for the part number so I could also look specifically for that. I also was going to try some other repair places in case they already had the part in stock. They did not have the number written down and the mechanic was gone for the day, so they asked me to leave it one more day and he’d call me the next day with the information. Late the next day I got a call saying that they had called some other parts places and at first, they couldn’t find it, but then one guy called them back saying he had it. Awesome! But why didn’t they call those places the first time? The manufacturer isn’t the only place you can get parts from. Any way it would take two weeks to get the part in, which was putting me right up to the week of Christmas by the time they fixed it, and I still had a few things to make before then. I called at the beginning of Christmas week and was told they still didn’t have the part and would need one more week to get it in. I had to use my mom’s machine to finish up a few gifts before the holiday. Finally, today, I got the call that it was ready! There are two buttons I cannot use any more, the basting stitch and repeat pattern stitch, but that’s fine with me. I can’t wait to use it! 1978 was super advanced, I can do buttons, haha. I actually just recently got the buttonhole and button feet for this machine although it’s now occurring to me that I think I need the repeat pattern switch for them. I still need to test it though because they had it on the medium speed switch, which never worked for me, I always sewed on the fast speed switch. So maybe those buttons will still work. © 2019 kris blogs. All Rights Reserved.